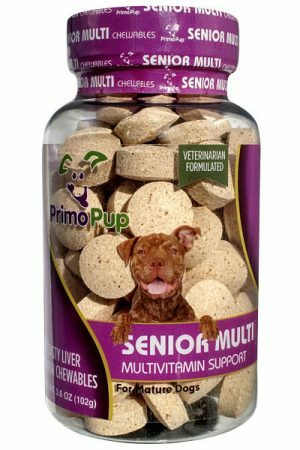 Primo Pup Multivitamins for adult dogs supply essential minerals and nutrients that are easy to digest and complement your pet’s normal diet to support their physical and mental well being. 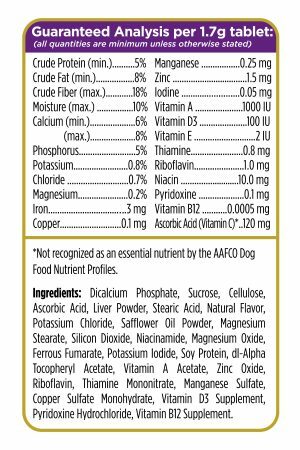 The Adult Multi Formula is developed by expert veterinarians to provide an optimal blend of nutritional support appropriate for adult dogs and is made with quality ingredients in a facility meeting human consumption standards. 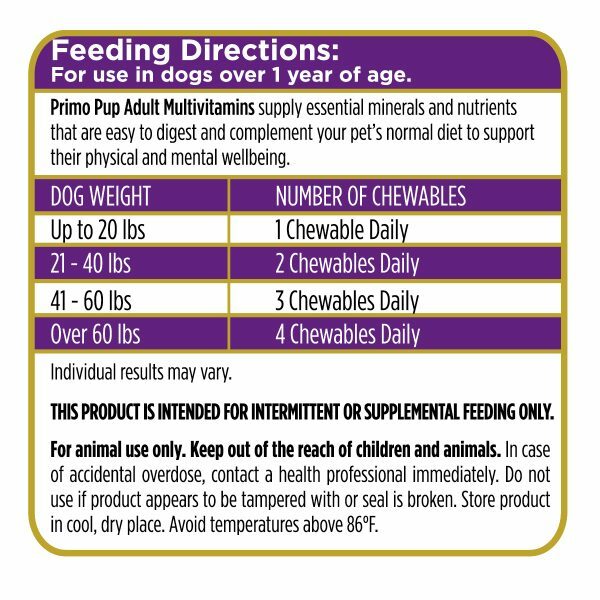 It is free of grains, artificial colors and artificial flavors. 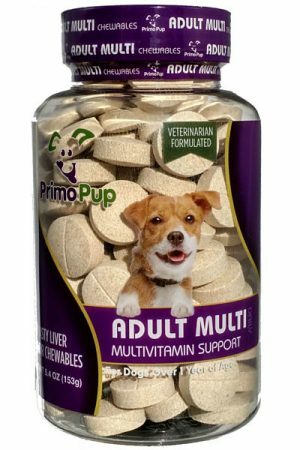 ⇒Formulated specifically for the adult life stage to support overall physical and mental wellbeing. Necessary for normal DNA synthesis and intestinal function. An Antioxidant that protects cells from oxidative damage. Especially important for muscular and reproductive function. Is helpful during times of stress. 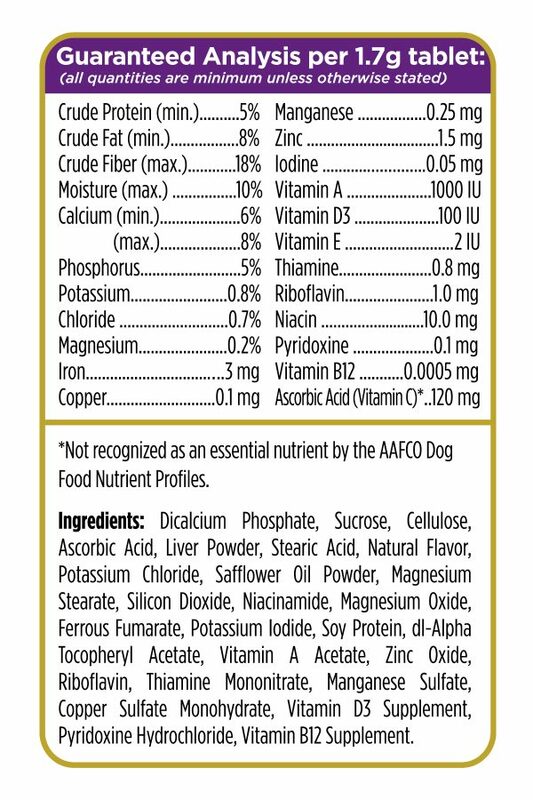 Is abundant in fresh foods, but is killed during the high temperature processing of dog foods. 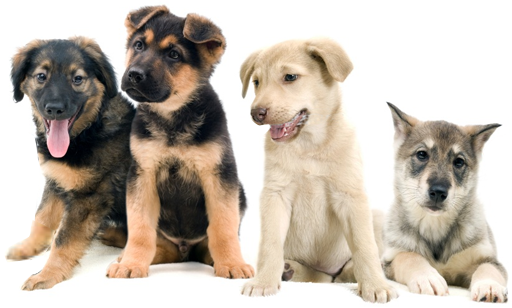 Minerals are present in small amounts in the tissues of all living things. 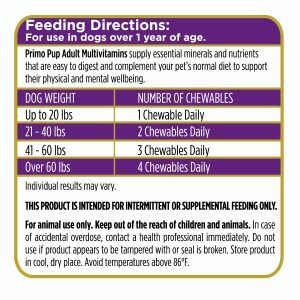 Teeth, bones, muscles and nerves have especially high mineral content. Minerals can be divided into two groups: the major minerals and the trace minerals. Required in gram amounts each day. Needed for muscle contraction, nerve transmission and for blood coagulation. It is also required to activate numerous enzymes that affect virtually every process in the cell. 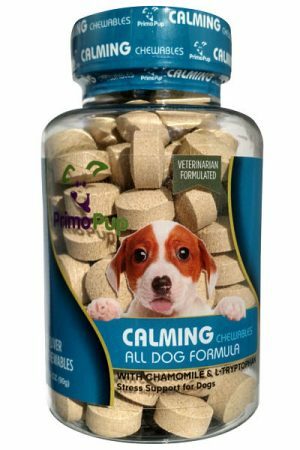 Strengthens dog’s bones and teeth. 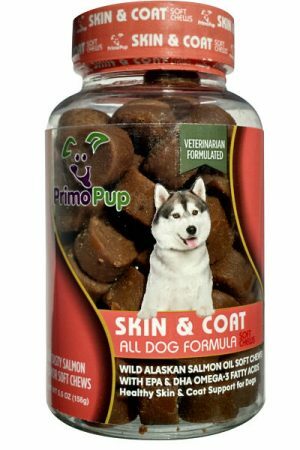 Plays a part in nearly all chemical reactions in your dog’s body. 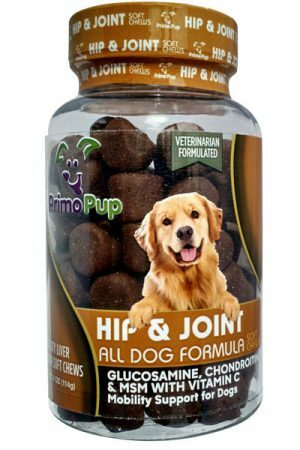 Strengthens dog’s bones and teeth. Helps nerves to function and muscles to contract. Helps heartbeat to stay regular. Also helps move nutrients into cells and waste products out of cells. 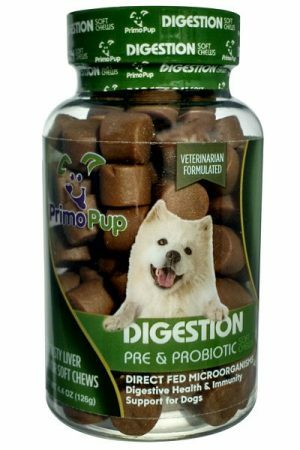 A trace mineral that has many different functions. It is needed for the production of blood and for the proper absorption of iron. 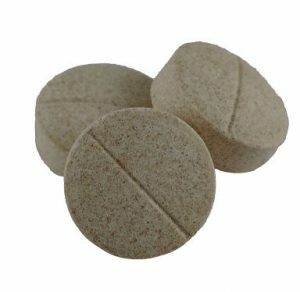 It is also involved in the production of connective tissue and in healing. A component of many different enzymes systems in the body. Most importantly it activates enzymes that regulate nutrient metabolism. Critical for the proper functioning of the thyroid gland, which regulates the body’s metabolism and energy levels and promotes growth. One of the most important electrolytes in the blood. It helps keep the amount of fluid inside and outside of cells in balance. It also helps maintain proper blood volume, blood pressure, and pH of body fluids. 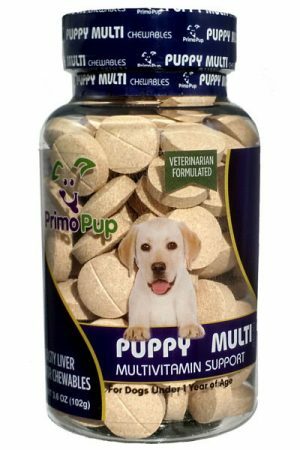 Primo Pup Multivitamins are easy to digest & compliment your pets normal diet to support their physical & mental wellbeing. Crude Protein (min) 5%, Crude Fat (min) 8%, Crude Fiber (max) 18%, Moisture (max) 10%, Calcium (min) 6% (max) 8%, Phosphorus 5%, Potassium 0.8%, Chloride 0.7%, Magnesium 0.2%, Iron 3 mg, Copper 0.1 mg, Manganese 0.25 mg, Zinc 1.5 mg, Iodine 0.05 mg, Vitamin A 1000 IU, Vitamin D3 100 IU, Vitamin E 2 IU, Thiamine 0.8 mg, Riboflavin 1 mg, Niacin 10 mg, Pyridoxine 0.1 mg, Vitamin B12 0.005 mg, Ascorbic Acid (Vitamin C)* 120 mg.